O’FALLON — The end of Wednesday’s Class 3 third-place game had a familiar look for the Fatima Comets. After chipping a lead down to 6-4, the away team brought the winning run to the plate in the final inning. This time, unlike Tuesday’s semifinal against Springfield Catholic, the Comets were the ones trying to hold on. And just like the day before, the seventh-inning rally fell short, and the game ended 6-4. Fatima clinched a third-place victory against Central: New Madrid County. “On the mound, actually, I talked to Josh (Holtschneider), and he was like, ‘Yeah, this is the exact same score as last time. Hopefully it doesn’t get any worse,’” first-baseman Will Robertson said. Holtschneider got the Comets out of a jam. In relief of Anthony Swarthout, he registered all three outs in the seventh, allowing just one walk. Coach Scott Kilgore gave the sophomore a pep talk before he closed out the game. “I tried to get him relaxed as possible, although I knew that was probably not gonna happen,” Kilgore said. Holtschneider secured the win with a strikeout and catcher Zachary Hudspeth ran out to congratulate him with an embrace. “This is a life-changing moment for me in my baseball career,” Holtschneider said. Kilgore hoped the momentum sparked from the late-inning scoring against Springfield Catholic would carry over to Wednesday’s game. Although the Comets scored in the first on a pair of two-out hits, Fatima fell flat in the next three innings. All told, the Comets left nine runners on base. But the bats made a late arrival again for Fatima. Robertson hit one of five singles in the bottom of the fifth, and the Comets added three runs. Kilgore told his players before the inning to force the Eagles into a pitching change. In the sixth, John Fick reached on a dropped third strike and Robertson drove him in with a triple. Robertson took advantage of the extra bag and scored Fatima’s final run on a wild pitch. 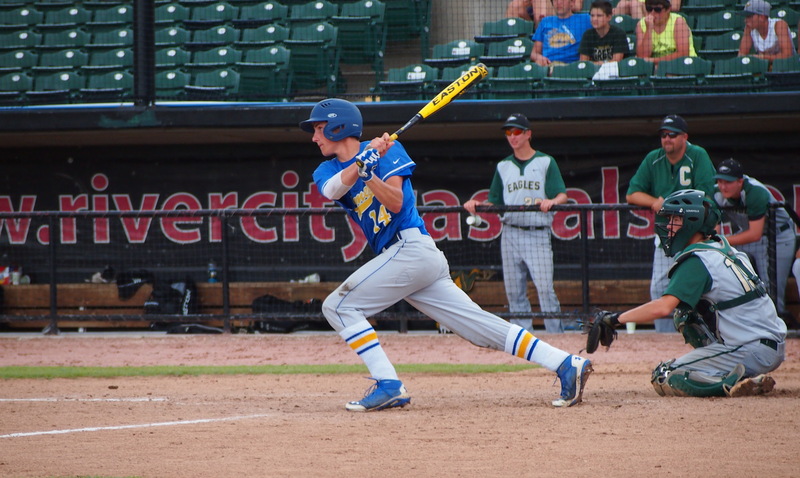 After putting their first runs on the board in the sixth, the Eagles wreaked some havoc in the seventh. They tallied three hits, a walk and a hit-by-pitch in the inning before Holtschneider sealed the deal. Logan Vogel was the winning pitcher for Fatima. He gave up two earned runs in 5 1/3 innings, allowing seven hits and striking out 5. He retired the Eagles with two runners on base in each of the first three innings. The Comets won the state championship in 2013. This year’s team only graduated three seniors, and placed third despite never receiving votes in the state rankings all year. This entry was posted in Fatima Baseball, Fatima High School, Jefferson City News Tribune, Jefferson City News Tribune Sports and tagged game stories. Bookmark the permalink.